In Cardiff, three defendants facing charges related to an attempted disruption of an arms fair have just been acquitted. “The BPRA has had many successes in struggle to establish better conditions for prisoners and against the arbitrary rule of the prison authorities. For this reason Jock and his comrades became a target of repression. Recently he had been charged by the prison administration with the distribution of BPRA stickers. According to the authorities, stickers with a slogan “When injustice becomes the law, resistance becomes a duty” are promoting racism and are hate speech! No-one explained against which race or national group those stickers are supposed to be directed, but as a result Jock had been stripped of all privileges for a period of 2 years. That means he had been stopped from continuing his university studies, his visits have been severely limited, he is not allowed any of the supervised leave that he had previously been granted and he has been refused any paid work. Across Europe, police operations and raids continue in the wake of last year’s G20 protest in Hamburg. It’s Going Down has just published an English-language translation of a detailed interview on the subject, and Enough is Enough has fairly regular updates. Freedom News also has a brief write-up on the subject of the repression faced by anarchists in Yogyakarta, Indonesia, since May Day there. In the US, the growing revolt against ICE and border controls is developing too fast to keep track of – this feature from IGD has a good round-up of what’s been going on these last few days, and Crimethinc have a collection of a few accounts from the blockades, along with an account from the weekend’s antifascist clashes in Portland. Funds have been set up for both legal and medical costs coming from those events, although as far as I can see rally.org requires a US address and phone number before you can donate, so non-US residents wanting to lend a hand to those who confronted fascists in Portland may want to send their donations to Portland ABC or Rose City Antifa more directly. Two final notes: The family of anarchist prisoner Eric King are going through some stress and asking for support, and you can help them out by purchasing this fundraiser compilation. 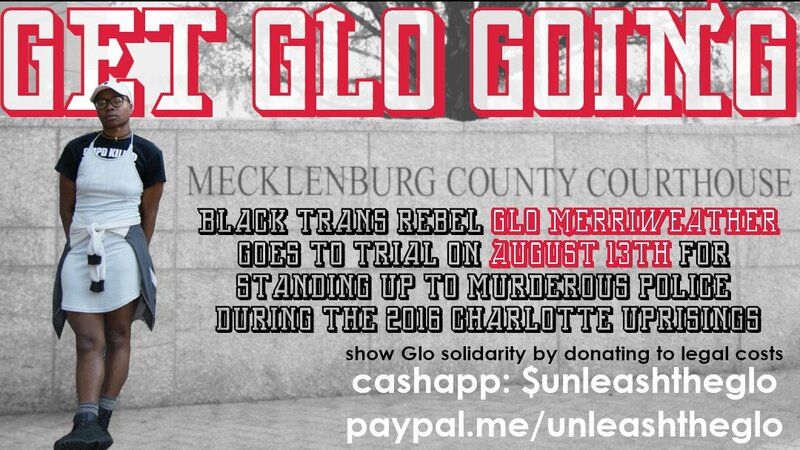 In North Carolina, Glo Merriweather is still awaiting trial on trumped-up charges in retaliation for challenging the police narrative around a shooting during the Charlotte Uprising, and needs help with legal fees and paying their bills – you can donate here. This entry was posted in Anarchists, Repression and tagged arms trade, Bulgarian Prisoners' Association, Cardiff, Eric King, G20, Glo Merriweather, Jock Palfreeman, Portland Anarchist Black Cross. Bookmark the permalink.